Spray drying is a continuous and scalable manufacturing process commonly used in the pharmaceutical industry. Due to its scalable and continuous nature it is possible to apply Quality-by-Design (QbD) and Process Analytical Technologies (PAT) early on in the development of a spray drying process. Knowledge gained from QbD e.g. Design-of-Experiments (DoE) and PAT increases process understanding and the knowledge can be readily applied when scaling up the process and in production scale application of PAT i.e. especially with respect to the control strategy. 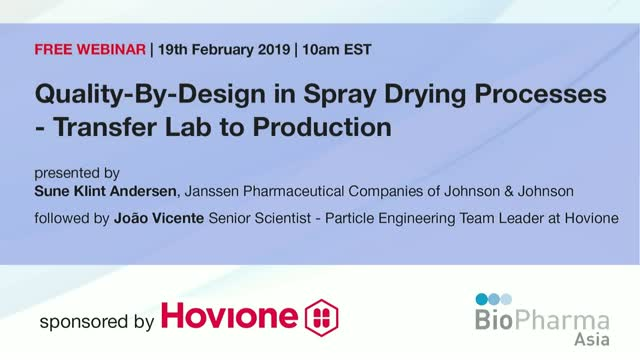 The Webinar will discuss the application of QbD early in the development and how the obtained knowledge can be used to optimize transfer of the spray drying process to production scale including PAT strategy.